Inspire your fantasy with this radiant PANDORA Shine™ Enchanted Crown ring in 18K gold-plated sterling silver. 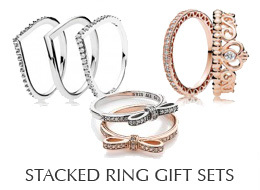 Amazing on its own, it's also fabulously stacked with sterling silver and PANDORA Rose™ rings. Ships Monday, April 22 if ordered in the next 2 days, 22 hours and 23 minutes! Enchanted Crown ring in PANDORA Shine with 36 bead-set clear cubic zirconia.